Innovation is a key element within any successful company, enabling creative vision, adaptive qualities and long-term strategic thinking. In this fast-moving technological age, companies need to respond quickly to advances in technology. New idea generation and problem-solving must be an integral part of a company’s strategic planning should it wish to adapt to these changes. For some companies, innovation is a natural step in their long-term thinking; for others, it may be something which they have given little thought to, whilst some simply don’t know where to start. In reality, the majority of companies will need to innovate at some stage in order to sustain successful business growth. Innovation can take many forms, it can be a new idea, product, method or process, you can innovate to meet your customers need, adapt to change or to grow your business. Many fear the term innovate, assuming that it is expensive, drawn out and a distraction from the day-to-day business. Not having access to the necessary equipment or knowledge is also a concern. The good news is that innovation doesn’t need to be any of the above, in fact, there are numerous supports available to Irish companies in this area. Agencies like Enterprise Ireland provide programmes, funding, advice and support which will assist you on your innovation journey. One such programme is Enterprise Ireland Technology Gateways, which provides Irish companies with a means to develop new or enhanced products or services by providing access to over 300 industry focused researchers and engineers, specialist equipment and facilities, through their 15 Gateways situated in 11 Institutes of Technology. Companies can access these through various Enterprise Ireland supports or by directly funding the project. 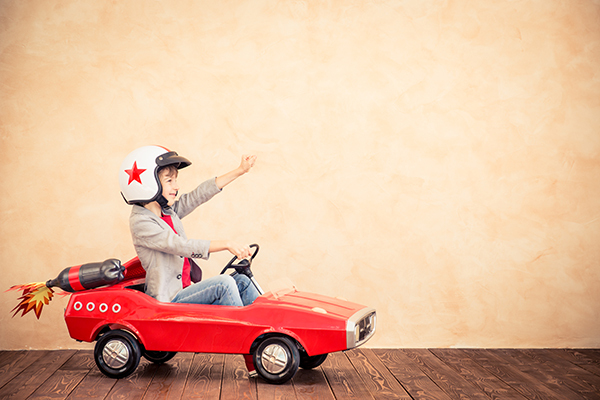 So what can you expect along your Innovation Journey? To help you along the way, we’ve created a handy innovation roadmap which outlines what you can expect and the support and advice available to you when working with Technology Gateways. Each innovation journey starts with the creation of a new idea or the acknowledgement of an existing problem within a product or process. From the outset, some companies may have a clear vision of what they need, whilst others are only at the beginning and may require additional time and support. What is important however is that no matter how far along the road you are, you’ve started your innovation journey. You may already know which Gateway is the most suitable for your needs, but if you don’t your regional gateway is a good starting point and our experienced Gateway team will guide you in the right direction. Each Gateway has a dedicated manager, business development staff and team of researchers and engineers who act as key contact points for industry. Once you have contacted your Gateway team, the Gateway Manager will work with you to outline your company need. This is essential as it is important to clarify at this early stage the product or problem, what technologies are required, how it will aid the company and what stage the project is currently at. At this stage, the Gateway Manager will outline and discuss various funding options open to you, going through in detail the application process and eligibility for funding. Enterprise Ireland has a range of innovation funding supports available for Irish businesses. The main supports used in conjunction with the Technology Gateways are Innovation Vouchers, Innovation Partnerships and the Agile Innovation fund. All three offer various means of support to companies in a wide range of sectors. Companies can also directly fund projects undertaken with the Gateways. The Gateway manager will explain what to expect from the funding options most suitable for you. More information on all three funding models and eligibility can be found at www.enterprise-ireland.com. Ensuring everyone is agreed on the task at hand is of vital importance. It ensures the project runs smoothly, on time and on budget. Agreeing on deliverables at this stage means there will be no unexpected surprises further along the road. 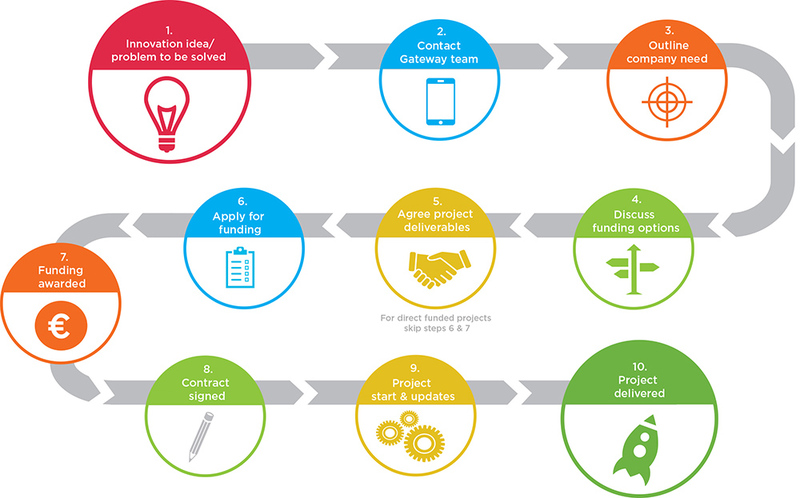 Please note, if the project is directly funded, steps 6 & 7 will be skipped. Companies often find funding applications stressful, don’t worry our Gateway teams are here to help every step of the way with support, guidance and advice on submitting your application. Please note that depending on the type of funding you are applying for, there may be strict application calls or deadlines in place. For example, Innovation Vouchers have an open call for applications three times a year. Check the call schedule or ask your Gateway Manager for the date of the next open call. Once you have applied to Enterprise Ireland for your funding and it has been considered, you will receive an answer confirming your funding status. If you have been successful with your application, you’re ready to move to the next stage! Once you receive confirmation of funding, contact your Gateway Manager and inform them of your successful application. They will arrange a meeting to sign contracts for the agreed work package and confirm a start date. Once everything is in place, your project will commence on the start date agreed and will be managed throughout by your Gateway team, which will also update you on how your project is progressing. These are important as it allows you to plan for the next stage of your innovation journey. You will be informed by your Gateway team when your project has been completed. The team will provide you with the agreed outcome as laid out in the project deliverables. Remember that innovation is an ongoing process, no matter how big or small your project is, there is always scope for improving, redeveloping or advancing. Talk to your Gateway manager about the next steps in moving your project forward. If you are interested in further information on Enterprise Ireland Technology Gateways you can download our Gateway booklet, sign up for our quarterly Technology Gateways newsletter or follow us on Twitter to keep up with the latest network and cluster news.